If there was one thing I couldn’t wait to do when starting a family, it was starting our own family traditions particularly at Christmas. Although it’s only now that I’ve become a parent and realise the full extent that goes into keeping everyone alive throughout the entire year, one has to choose very wisely as to what kinds of traditions you want to invest your valuable time in. Take this right old faff of a craze, ‘Elf on the shelf‘ for example. I absolutely take my hat off to any parent who has the energy and oomph to pull this one off for an entire month. Your kids are very lucky. I for one will be taking an oath that I won’t ever be conned/tricked/guilt tripped into inviting any sodding elf to stay at our house for four weeks just to have to purposely create a mess (that said “elf” made whilst we were sleeping) and then have to clean it up the following day and again every day for a whole month! No thank you, I’ve got enough crap to clean up without creating it myself. 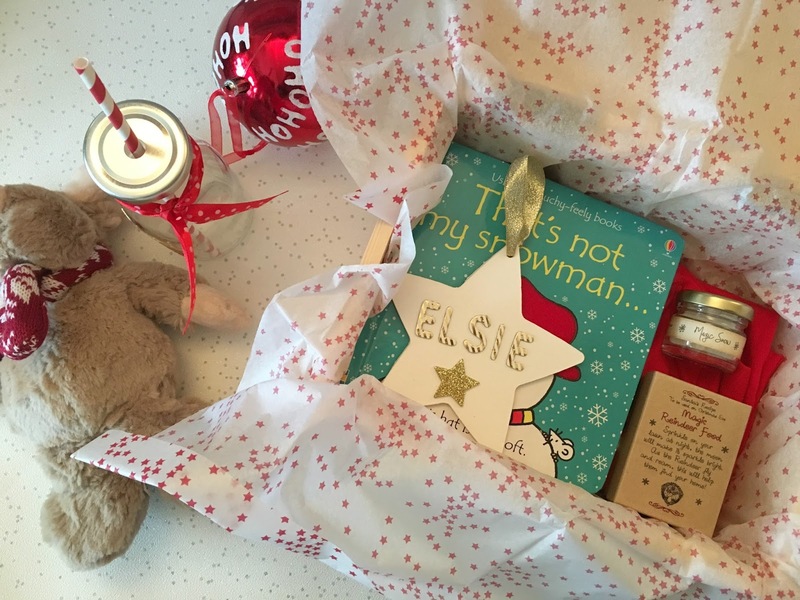 But there is one new fad or tradition that I would like to start and that is the Christmas Eve Box and so I thought I’d share the first box that I’ve put together for Elsie this year. I had been planning to write this post for the beginning of December, but, like everything in my life these days, plans mean diddly squat. 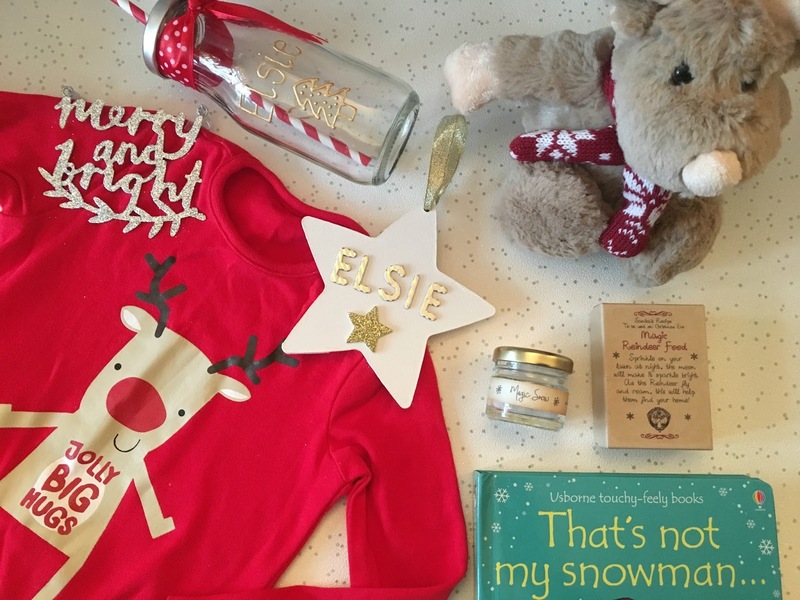 Plus our Christmas Eve Box didn’t actually arrive until two days ago, so instead I thought I’d do this post with a twist and include some DIYs and ideas for any last minute parents who still plan to put together a box for their little ones. Most of the contents can be picked up at your nearest supermarket- if you’re brave enough to face the last minute Christmas rush! 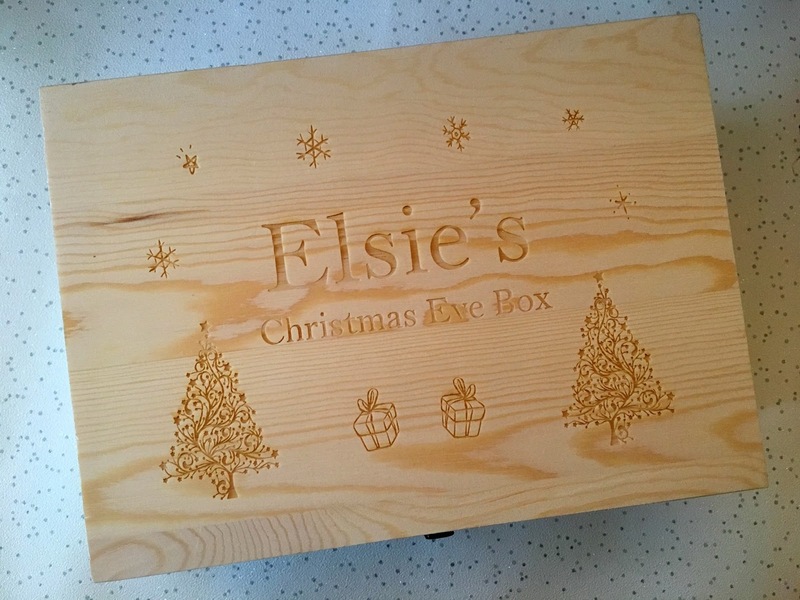 I ordered Elsie’s personalised box around the beginning of November from the Festive Studio. It was a little splurge, but it’s a one off and I hope to use it for many years to come. 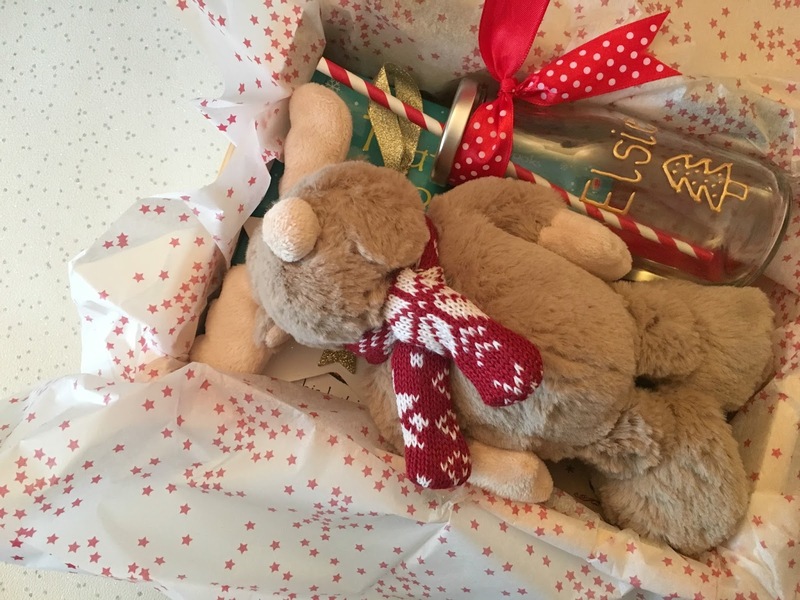 Baring in mind that most fifteen month olds will be totally unaware of all the effort we’re going to, a simple shoe box covered in wrapping will absolutely suffice- they’ll be more interested in the contents, or tissue paper anyway. The Rudolph bedtime onesie came as a two pack from Tescos which I purchased a few weeks ago and now every blooming supermarket I’ve been to this week (and I’ve been in quite a few!) have already put their festive clothes on sale, so if you’re quick you can pick up something suitable and half price just in time. I’m really trying to limit the amount of sugar Elsie has which is turning into a bit of a challenge now that she is aware of everything. I’ve even had to hide her advent calendar because she’s become a little obsessed with it. Whoever invented chocolate advent calendars has a lot to answer for. So instead of filling her box with treats that will keep our already overactive non-sleeper awake until New Year, I’ll be putting in one of her usual Naked fruit snack bars. Well I might as well whilst she’s none the wiser. Another completely unnecessary item this year, but a cute touch none the less is some reindeer food. You can relatively quickly make you’re own using this recipe and can package it up using any one of these ideas on Pinterest and add a quirky poem which I found here. Oh and the magic snow, I have no idea what it’s for, but apparently it’s a thing. 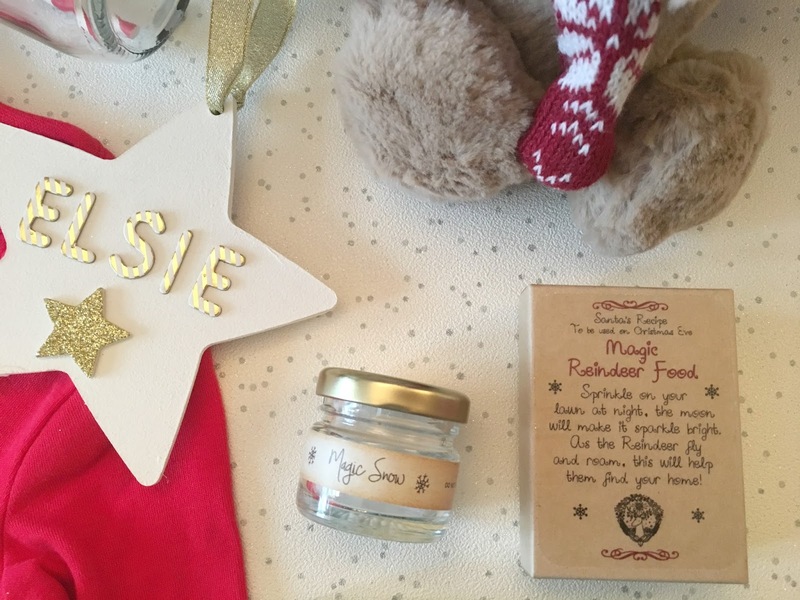 So if you’ve got the time (or can be bothered) and want to inject a little extra magic this year, then similar ideas and DIY’s can be found over here. I picked up this fluffy reindeer from Waitrose and again I’ve seen similar toys all in the sale already at various supermarkets so hopefully something fun can be purchased reasonably easily and more importantly, cheaply. 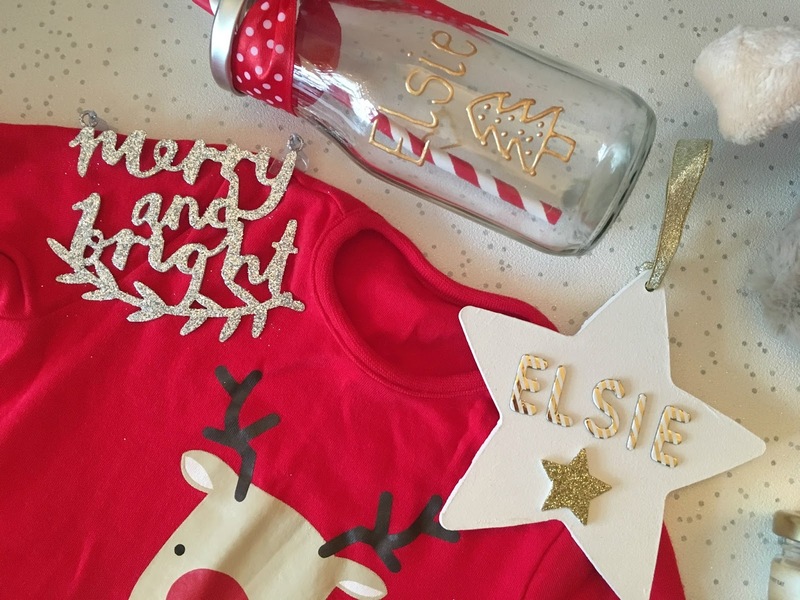 My friend made this very cute personalised milk bottle for Elsie which she said was super easy to make, so I’ve found a selection of easy(ish) DIY’s such a this snowman bottle, reindeer bottle, and sparkly snowflake bottle. There wasn’t much point in including a DVD or activity set for Elsie. She’s got the attention span of a gnat, but she does love a book. These touchy-feely board books are her particular faves, so I picked up ‘That’s Not My…Snowman” in my local supermarket, which will keep her entertained for all of two minutes on Christmas Eve. Wishing all my lovely readers a very Merry Christmas and a Happy New Year. Thank you so much for your continued support this year. I appreciate that I’m not the most consistent of bloggers, but it means so much to know that you’re still there when I do find a moment to blog. Next year I really hope to make more time for the blog as it makes me really happy and finding my happy place has never been more important to me than after this year.